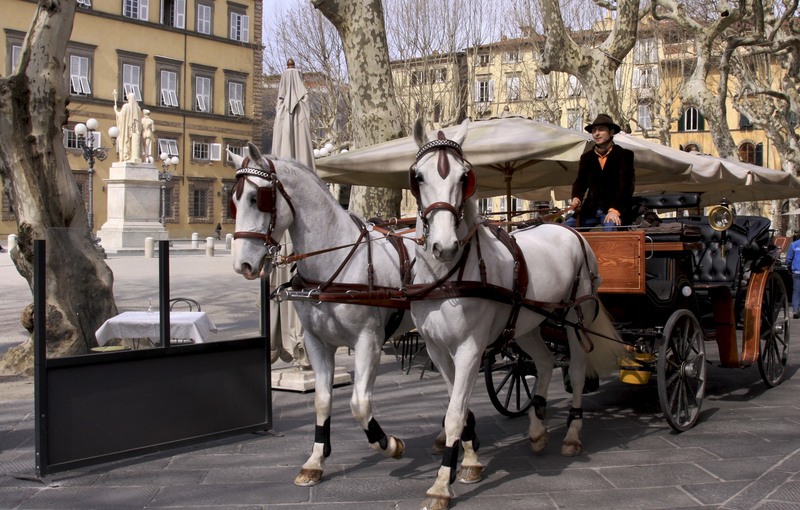 Traveling with Barnaby is always fun — he’s easy-going, cheerful, interested in history, art, architecture and music, and he has a little bit of a mischievous side that does things like take clandestine photographs in museums and galleries that specifically forbid using your camera. Barnaby would never dream of damaging a work of art — he doesn’t use a flash, and he probably wouldn’t “appropriate” any of the art he photographs (something a lot of popular artists do all the time). I don’t encourage Barnaby, but then, I enjoy looking at the photos afterward and thought I’d share a couple. This first one is of an art installation of Nate Lowman’s (the son of Carolyn and Bill Lowman of Idyllwild). 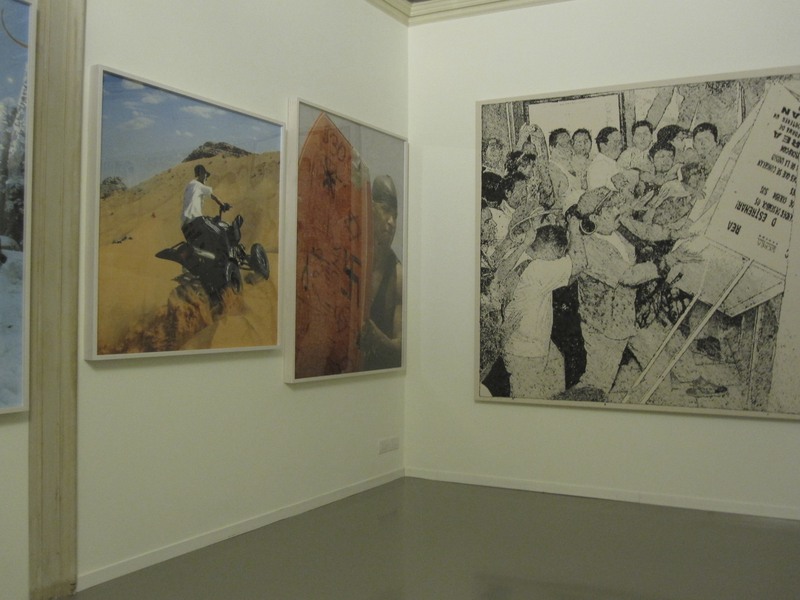 These paintings are currently at the Palazzo Grassi in Venice as part of a survey of contemporary art. I don’t know if Nate is wildly popular in the art world, or if we were just really lucky, but we were able to see his paintings in shows in Venice and at the Guggenheim Museum in New York on this trip. 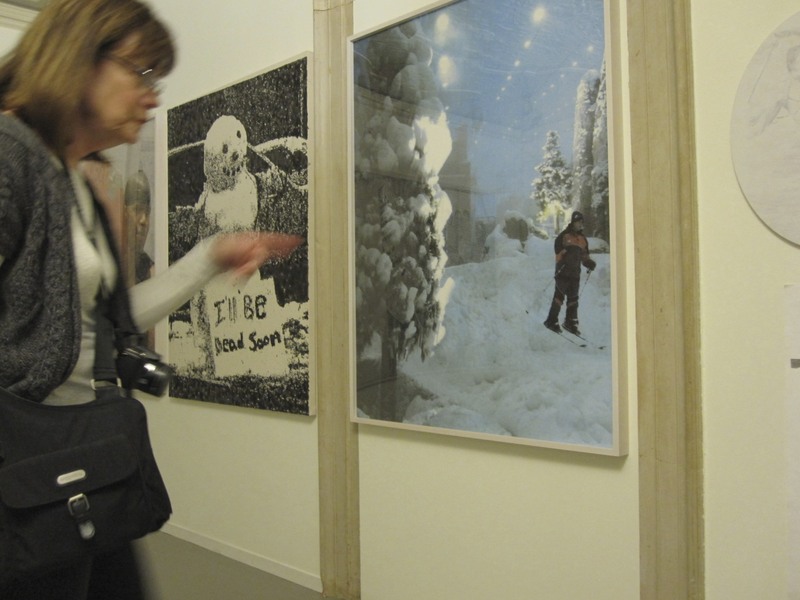 He has several pieces in both shows — hung alongside modern giants like Richard Prince and Cindy Sherman. We think it’s pretty cool that a kid from Idyllwild can make it in the art world. The painting below, next to the Mona Lisa, is perhaps the most recognized work of art in the world. We’ve all seen the Last Supper so many times that we probably have some opinions of it’s size, color, etc. Mine were all wrong. 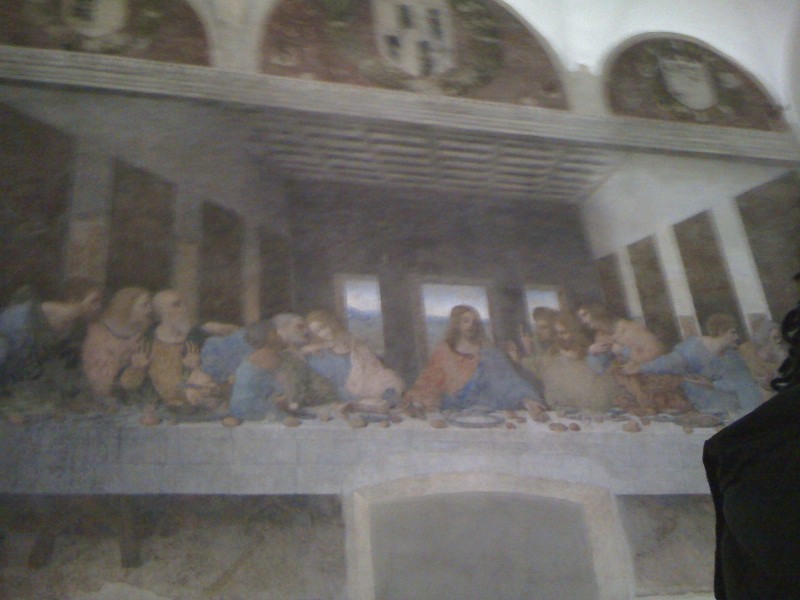 Leonardo Da Vinci was commissioned to decorate the dining hall of a Dominican Friary in Milan. He used an experimental technique for his fresco and the resulting painting started deteriorating almost immediately. There’s been a lot of work done through the years to try to save it, but it probably won’t last. I was shocked by its size — about 29 feet wide by 15 feet high. I’ve always pictured it like those little 3X8 inch reproductions shellacked on cedar planks, like the one in my mom’s kitchen. The other shocker is that it’s really beautiful — the colors absolutely glow. After booking ahead several months, (or joining a guided tour like we did — also booked months in advance), you wait until your specified time in an outer room, then you’re shuffled into another room and wait 5 more minutes behind sealed doors while the air is dried and changed, only then are you allowed in your group of 20 into the old dining hall for a total of 15 minutes, not enough time really to admire the great painting. Imagine what it was like to be a guy who gets to eat his supper every night with that perfection. Even though it’s really big in real life, Da Vinci designed it so that it looks life size for the viewers — he wanted you to feel like Jesus and the guys were there having dinner with you. The 15 minutes flew by for me. I didn’t want to leave. I wished I wasn’t so ignorant about Bible stories so that it would make more sense. In the meantime, some people broke the rules and pulled out their cell phone to sneak a photo. It was a pretty cool experience and I’m kinda glad to be married to that wild guy and have this small memento. As you can see, it’s not of sufficient quality to make prints for ashtrays or plaques — we’ll leave that up to all those talented Italians who have knocked off the painting a thousand times. I know you all are probably wondering what my favorite “work of art” from our trip to Italy could be — after all, we visited some of the most incredible museums in the world: the Uffizi in Florence, the Accademia in Venice, and the Guggenheim and Metropolitan in New York City. I guess I’m just a country girl because I still get the most excited when I see a horse — in a painting, a sculpture, or a living horse. 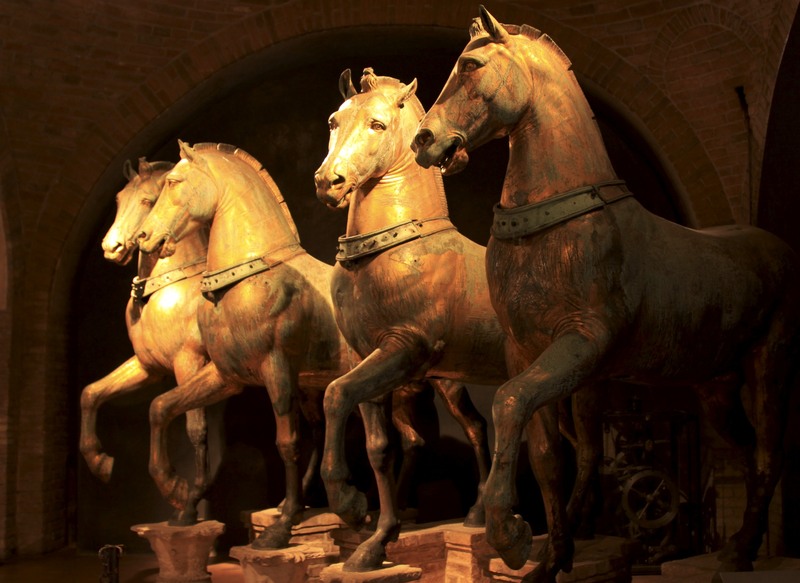 It doesn’t matter if the horse is bronze and was stolen by the Venetians from Constantinople and displayed on top of the Basilica in San Marco Square for 500 years like the quartet on the right, or the lovely pair that were pulling a carriage through the streets of Lucca. I guess I was just missing my big boys at home. This entry was posted on Wednesday, March 31st, 2010 at 5:31 pm	and posted in Uncategorized. You can follow any responses to this entry through the RSS 2.0 feed.